A quick throw-in for Jonny Greenwood’s latest effort. 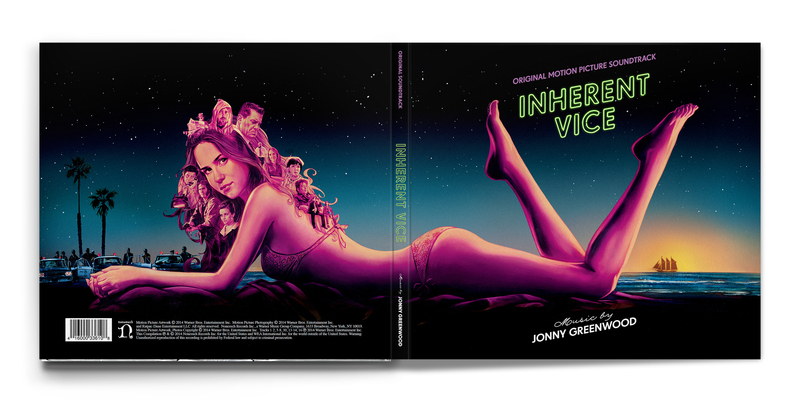 The whole ad campaign for Inherent Vice takes us back to Boogie Nights times and I’m sure every P.T. Anderson fan goes nuts for this film. Overall this 80’s inspired neon style is currently coming back big time. To use this widescreen banner for the custom digipack was self-evidently, I’m only wondering why no-one else did it before me (at least in the custom cover circles I’m hanging around). Not much work was necessary for this cover. I just had to get hold of the proper font types (“Drescher Grotesk” and “HLT RollingPen“) and extended the artwork a little bit top and bottom to be able to allign it evenly. That’s it basically. For further comparison please have a look at just the front covers below. I like the “V” the legs make, as if they’re pointing upwards towards the title. That said, I actually really like the original for the grainy texture, and it’s hard for me to part with it. All the same, great cover!